The Lagos State Police Command on Friday 9th March 2018, recorded another case of man's inhumanity to man. This time around, it was between one Nkeiruka Ngwu, female, 36 years old of 47 Ogundana Street, off Allen Avenue, Ikeja, a mother of four children and her ten- year -old househelp by name, Chioma Samuel whom she brought to Lagos from Umuoju, Ngwu in Abia State sometime in January 2018 after the death of the poor girl's father. Rather than keeping the promise of good life she made to the poor girl before she was handed over to her, Nkeiruka Ngwu made life a living hell for the child. She was mentally and physically abused with many injury marks to show for it. Her latest tale of woes was recorded on Wednesday 7th of March, 2018 when the suspect allegedly used a well heated clothes iron to cause grievous injury on the victim's hands and legs. She also poured hot water on her which scalded her skin. 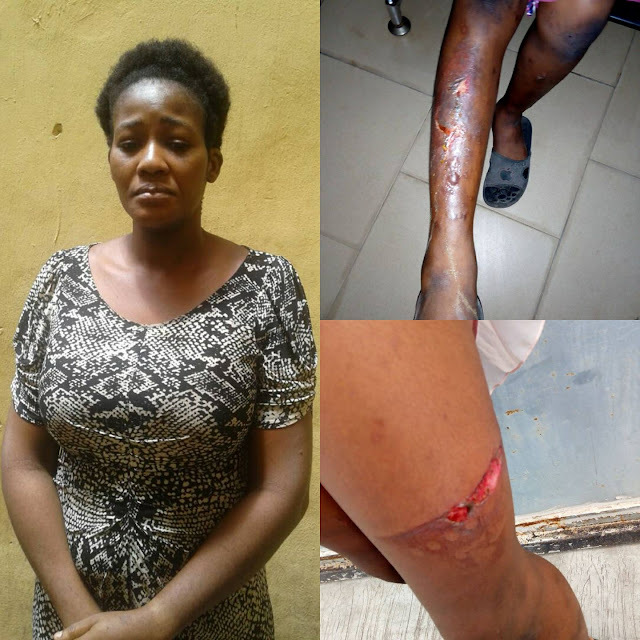 However, on Thursday 8 March, 2018, Nkeiru's cup of iniquity got filled when she brought her children to a private school located somewhere in Ikeja, unfortunately for her, the prying eyes of other mothers who came to the same school to drop off their kids, noticed the gaping wounds on the upper and lower limbs of the victim who accompanied the suspect to the school. After questioning the girl, they waited for her Madam who had gone to drop her kids in their different classrooms. When she finished and was about to drive off, she was confronted by these women who nearly mobbed her. They were calmed by some teachers who heard their piercing voices as they rent the air. The women told the suspect to take the girl to a hospital or else they would petition the Commissioner of Police Lagos State whom Lagosians have come to know as one who takes strong stance against such crimes and other related crimes against children, women and vulnerable persons in the society. Investigation into the case is in progress meanwhile the adult offender would have her day in the court of law tomorrow Monday 12th March, 2018.